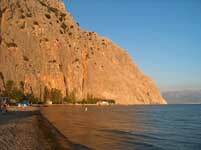 Chalkeia (Greek: Χάλκεια) is a former municipality in Aetolia-Acarnania, West Greece, Greece. Since the 2011 local government reform it is part of the municipality Nafpaktia, of which it is a municipal unit. Population 3,161 (2001). The seat of the municipality was in Trikorfo. 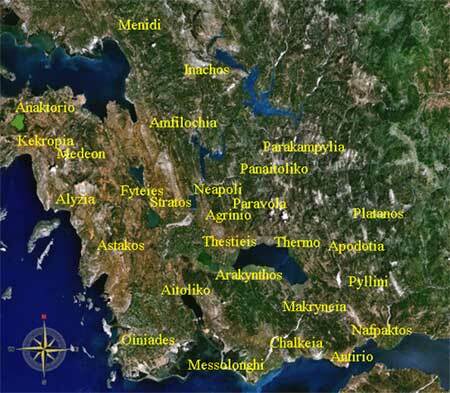 Kryoneri (Greek: Κρυονέρι meaning "cold water") is a settlement located east-southeast of Messolongi. Its population in 2001 was 110. 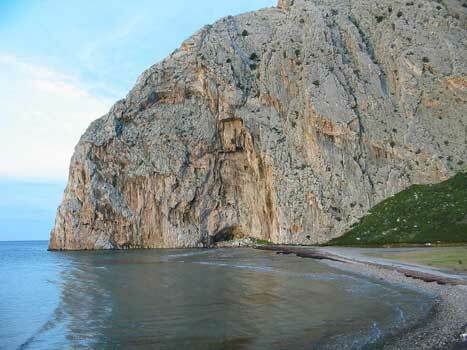 It is located by the banks of the Evinos river and is a popular summer destination. The rocks of Varasova, a very steep mountain is to the east. It features owned beds and hotels. It had the old railway line of the Hellenic Railways Organisation, the Northwestern Greece Railway of the (SVDE) in which it ferried freights from the port of Patras in which is across. Its panoramic views includes the hills to the northwest, the Ionian Islands including Zante, Kefalonia, Ithaca, the Echinades and the Peloponnese to the south including the Panachaiko, Movri and the Scollis mountains. Kryoneri has a few churches and the central square (plateia), its nearest lyceum (middle school), gymnasium (secondary school) and banks are in Galatas.